In the end, Secure Investment was neither. The popular currency trading site for small investors vanished in early 2014, never to return. It took more than $1 billion in users’ money with it, and the situation offers a graphic demonstration of how to spot a financial scam. Secure Investment.com catered to smaller investors, making trading decisions for them with the promise of guaranteeing their principal. According to a recent report by Bloomberg Business, the site was once even more popular than the well-known currency trading platform Forex. The site was easy to use and offered individual investors a quick and simple way to track investments and see results. At the height of its popularity, Secure Investment claimed that it had traded nearly $5 billion daily in over 140 countries for more than 100,000 investors at all levels of participation. Its website claimed to offer managed investing without all the hassle – and while its own reported numbers might be suspect, plenty of investors did sign up. Most of them didn’t know, or perhaps didn’t care, that the company’s posted address was an office suite in Panama. But users who did a little digging found that out, and plenty more. And the red flags began to wave. The company was willing to show its licenses only to users who had deposited at least $1000. Investors weren’t allowed to withdraw any of their funds until the end of the investment period – and while the numbers were posted for Secure Investment’s trading activity, individual investors couldn’t check their accuracy. In an age of active social media, most businesses gather reviews from users, both positive and negative – and those reviews are generally easy to find. But not for Secure Investment. One user noted on a Forex forum that there were no complaints posted about the company. Nor were there any positive reviews. That doesn’t necessarily mean that everyone was satisfied, though. It could simply mean that there just weren’t that many users at all. For users paying attention, the math in the claims made by Secure Investments didn’t add up either. And although the site was strewn with earnest video testimonials, most of those were performed by actors hired for the job. All the pieces of the puzzle fell into place when, in early 2014, Secure Investment vanished. Bloomberg recounts the story of a British user whose experience was typical. When he and his wife decided to invest, they were asked to trade their pounds for dollars and wire them to banks in Australia and Cyprus. Over the months that followed, they got reports of staggering gains to their accounts, posting a fourfold increase on their investment in less than a year. But when they decided to withdraw some of the money, they were met with stalling and obfuscation. The system was down, said Secure Investment in an email. They apologized and begged for patience. The very next day, though, the whole site went offline, taking investors’ money along with it for an estimated $1 billion or more in losses. It hasn’t been heard of since. The story of Secure Investment is typical of modern financial scamming. The company created a slick looking casino online website that offered lots of carefully managed information with seemingly logical explanations for things like its constantly changing list of partner banks. The company generated its own good publicity with scripted video testimonials delivered by actors paid as little as $4 for the job. It posted fake trading numbers on the site. It created its own network of “paper” companies and directed investors to send money to bank accounts owned by those companies – a tactic that laundered investor money and created a complex paper trail that hid the money from investigators. That’s one of the reasons tracking down scammers like Secure Investment and bringing them to justice is a challenging task. The company had no real headquarters. Numbers and contact information were dead ends. The company only existed online, and the trails leading between it and the actual banks holding investor money are hard to navigate. Will Secure Investment’s duped investors ever get their money back? Investigators acknowledge that it’s not likely when a company vanishes so completely and erases its entire footprint. In cases like that, victims are usually out of luck. The investors who trusted Secure Investment with their savings – many of whom are professionals with some experience in other forex trading – say that they trusted the company because of its slick look and the reputation it created for itself. Secure Investment isn’t alone in the world of sophisticated financial scamming – a practice that’s becoming easier thanks to the Internet. And because it worked as well as it did for as long as it did, this company offers a number of lessons in spotting – and avoiding – frauds like this. 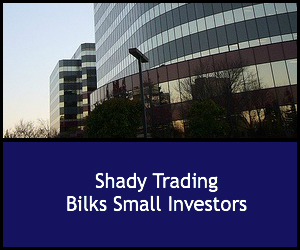 Prospective investors need t do their homework before handing over their money. The old adage, “if it looks too good to be true, it usually is,” applies here as it does in so many situations. Fraud experts point out that it’s essential to find out a company’s actual location and contact information – not just their website. And look for independent, third party reviews and experiences from previous users. It’s important, too, to check a company’s claims against the performance of other legitimate trading companies – and track down the specifics on any banks you’re asked to use for deposits and other financial transactions. Evans, David. “Forex Investors May Face $1 Billion Loss As Trade Site Vanishes.” Bloomberg Business. Bloomberg.com 12 Nov 2014.